I found an interesting blog post the other day that reinforced the reason why all employers should recruit thru services like Champion Personnel instead of hiring direct regardless of first impressions! Why put your company at risk for hiring the wrong person no matter how good they sound on paper or look in person or how experienced you as a hiring authority you may be? Don’t you think it would be better to use a service during your new candidates probationary duration and then if the candidate meets your company’s expectations hire them? This could happen to anyone of us who are in the recruiting industry! Thank you to Don Rowell for permitting this excerpt. Think before you ink! Your future will stink! Tattoos are becoming more acceptable in today’s workplace, but some should be avoided. I had a gentleman come into my office looking for work a couple weeks ago. He was well prepared with a resume which contained a good work history. He had worked for the same company for 23 years until the company closed down. On paper he was a great candidate for any of my clients. That was why I scheduled the interview with him. But once we met, everything went down hill in two seconds flat! The first issue was the obvious stench of either last night’s beer or this morning’s breakfast. I didn’t even bother to address this issue for there was an even bigger issue looming, if you can believe it. In the middle of his forehead, was a black BOLD 3 inch skull and crossbones tattoo. In the middle of his forehead! 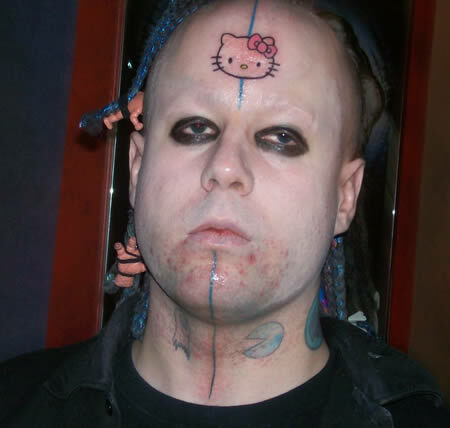 He did have a lot of tattoos on his arms as well but the one on his forehead overshadowed everything else. I couldn’t help to ask what he was thinking when he got such a large tattoo in a spot that cannot be covered. He explained to me he had worked at the plant so long he never thought he would ever need another job so he figured it was a safe thing to do. I really didn’t know what to say to him other than I would not be able to help him find employment (based on the stench of alcohol of course). At that time I was alone in the office and thought it best not to broach the subject of alcohol since my tattoo question had riled him up a bit. The story should have ended there but it didn’t. About two weeks later I received a notice of a complaint from the areas Better Business Bureau. The tattooed gentleman had gone to the local unemployment office to report, and when asked if he had been seeking work he told them he tried but I told him to simply live off the government programs because he was a lazy ***hole. When asked in the complaint what he felt I should have done he stated, “He should be forced to find me a job”. So now I was stuck defending my self against a person that not only was dumb enough to get a tattoo on his forehead, smelled of alcohol from whatever part of the day it happened and was a liar as well. I simply responded to the BBB with details of the interview and suggested that if the complaint was to betaken seriously then they should meet the gentleman in person. I really wish he had thought a bit harder before he got that tattoo on his forehead for now I will never forget him no matter what future job opportunity’s may come across my desk. He will be tattooed in my memory forever! What a great article. As Director of Sales for Champion Personnel I promote the fact we meet with each and every candidate prior to presenting to our clients. That face to face interview eliminates those issues for our clients. I know many agencies simple pull candidates from resumes on line and present them to clients without ever meeting them. I can’t tell you how many clients are amazed on our screening process and truly appreciate it. Champion Personnel will never do it any other way!